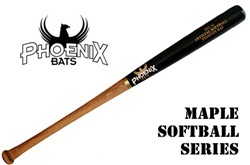 Phoenix Bat's Maple Softball Series are Rock Maple softball bats for the player who wants to play the game the way it was meant to be played - with talent and skill, not technology. Choose from 6 different softball models: SB1, SB2, SB3, SB4, SB5, and SB73. Available in 12 different colors. Add a barrel inscription at no extra cost!